From the infernal Baali, to the Lhainnan witches and the morbid faith of the Road of Bones, the Dark Medieval hides many secrets. Not all vampires hail from the 13 clans and not all follow the five great roads. 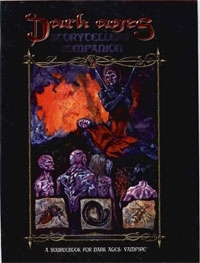 The Dark Ages: Vampire Storytellers Companion gives you access to secrets and advice to enrich stories and make them easier to tell. It includes six bloodlines, six minor roads, revised Disciplines, plentiful advice and all the game's useful charts. This screen and supplement help you bring the War of Princes to unlife. New options for players - six new bloodlines and six new roads. A Storytellers Toolkit featuring expanded rules on mass combat and systems for creating elder vampires.